GRAND CANYON — Several locations within the Grand Canyon National Park’s inner canyon will be without water or on stored water Friday into Monday while crews repair a break in the Transcanyon Water Pipeline. For tips on preparing for and hiking in the Grand Canyon, click here. This latest pipeline break is approximately 5 miles north of Phantom Ranch in an area called “the box,” a narrow section of the Bright Angel Trail along Bright Angel Creek. Typically breaks occur due to age of the pipeline, wear and tear and other environmental factors such as temperature fluctuations. On Friday, the flow of water from Roaring Springs will be turned off in order to begin repairs. Those repairs are expected to be completed and the waterline recharged on Monday. All other locations in the park will be unaffected by this pipeline break and repair. This includes the South Rim, Indian Garden, 1-1/2-mile and 3-Mile rest stops on the Bright Angel Trail and the North Rim. Water for Grand Canyon National Park comes from Roaring Spring, approximately 1,500 feet below the North Rim of the park. 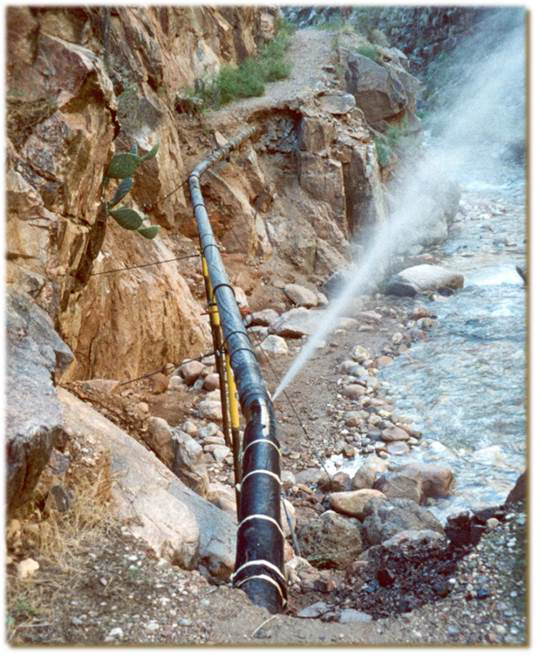 It falls through the pipeline along Bright Angel Creek to Phantom Ranch then up to Indian Garden where it is pumped to storage tanks on the South Rim. Water is pumped from Roaring Spring to Cottonwood Campground and the Manzanita Rest Area on the north side of the Bright Angel Trail.